Growing up on a ranch in Southern New Mexico, Kim Wiggins began his art career sculpting miniatures of the wildlife around him. Influenced by his father, a nationally recognized photojournalist, and mother, a pioneer rodeo cowgirl, he was encouraged at an early age to pursue the arts. By the time Wiggins was fourteen he began painting in oil and was working nights and weekends as a graphic artist for a national equine magazine. Wiggins' paintings have evolved with a unique, dramatic style. He populates his dynamic, bold canvases with ribbons of color, bulbous clouds, expressionistic mountains, sinewy trees and distorted houses. Among the youngest artists listed in Who's Who in American Art, Wiggins has been featured in several magazines including a cover story in Wildlife Art magazine. 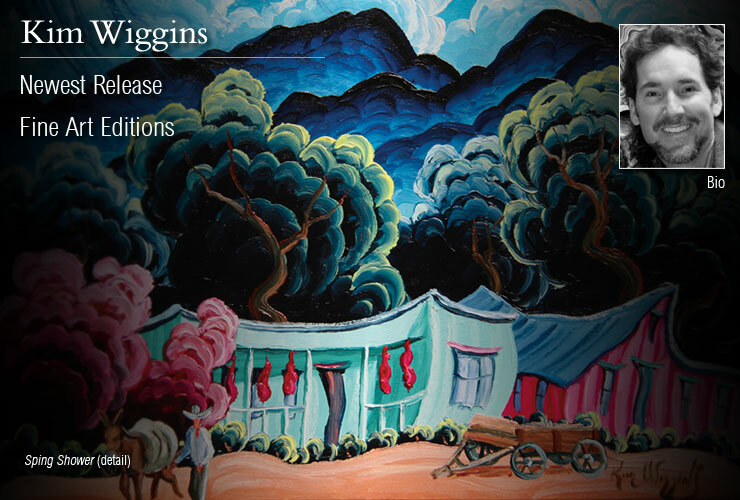 Wiggins has exhibited his work throughout the country and paintings are in the permanent collections of the several museums including The Autry Museum of Western Heritage.